The sessions start at 7.30 pm and finish at 9.30, with a break for supper between the two sessions. There is time for conversations with the presenters and each other. Child Removal – What changes are needed? 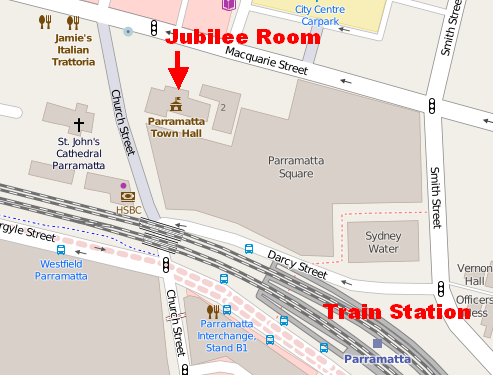 The Jubilee Room is attached to the Parramatta Town Hall (opposite St John’s Cathedral). The entrance to the Jubilee Room is on the left hand side when you face the Town Hall. Limited metered parking is available on nearby streets. The rate is $1.50 per hour from 6 pm to 8 pm; free after 8 pm. Parking is also available at the nearby City Centre Car Park between Macquarie and George St. The venue is only minutes from Parramatta station. Exit the station on the Darcy Street side and walk to the Parramatta Mall. We encourage you to register with the Parramatta Evening College on 9687 2072 since this helps with preparation and catering. You can turn up to any of the sessions when you wish. A donation on the night would be appreciated to help cover costs. Building Bridges provides an opportunity to come and hear Indigenous and a few non‑ Indigenous presenters sharing their knowledge, expertise and personal experience in an informal and relaxed atmosphere. Many people have never met an Aboriginal or a Torres Strait Islander Australian. Here’s your chance to meet them and discover that there’s more to Indigenous society and culture than is portrayed in the media, often negatively. While the Federal Government’s 2008 apology to the Stolen Generations was seen as overwhelmingly positive, both major political parties have so far ruled out any serious compensation (unlike Canada’s conservative government) to its stolen generations. The Northern Territory Intervention and similar programs, along with budget cuts, have created much controversy and had little positive effect on ‘Closing the Gap’. A move toward constitutional recognition, along with possibilities of treaty, needs extensive community discussion and deep change. It’s time to learn from Aboriginal people themselves. Padraic Gibson is a Senior Researcher at the Jumbunna Indigenous House of Learning at the University of Technology Sydney. He has extensive experience working with Aboriginal communities targeted under the NT Intervention. He is active in protest movements for Aboriginal rights and an editor of the Solidarity magazine. Tony McAvoy SC, a Wiri Man, is a barrister of the Supreme Court of NSW and a Senior Counsel. He focuses on native title and also works in administrative law, human rights and discrimination law, coronial inquests and criminal law. Steven Ross is a Wamba Wamba man with cultural and familial connections to the Mutthi Mutthi, Wiradjuri and Gunditjmara peoples. For the last 4½ years he has been the Aboriginal and Torres Strait Islander Community Capacity Building Officer with the Parramatta City Council. Kim Naden is a Kamilaroi and Weilwan woman from western NSW who pursued interesting human services roles in various towns and places before moving to Sydney, getting diplomas and becoming head of student services at Tranby in Sydney, the oldest Aboriginal run College. Kaleesha Morris is a Gumbaynggirr and Kulkalgal woman from the NSW Clarence Valley. Kaleesha studied Arts/Law at UNSW and has worked at Kingsford Legal Centre for the past four years in client and community engagement, teaching and law reform. Catherine Jackson is a Gidgup Aboriginal woman with Irish genealogy. She lives in Redfern and is a founding member of Grandmothers Against Removals (GMAR). Catherine advocates for the families of stolen and removed Aboriginal people, and for caring for Mother Earth. Laura Lyons and her daughter Bianca are both Wiradjuri women and currently have their children in care of the Department. They were involved in establishing the Redfern local group of Grandmother’s against removals, they are also the founders of the self help support group Werribee which is manned by volunteers to assist families who are at risk of losing their children / grandchildren. They are very passionate in working towards change in the departments current practices and the system. Their ultimate goal is to bring not only their own children home but all the Aboriginal children in care and to ensure that Aboriginal communities have control of Aboriginal child welfare. Jacinta Tobin is a Darug woman and descendent of Yarramundi. She is a singer, songwriter and student of the Darug language. She was the Events Coordinator of Burramatta NAIDOC celebrations in 2015 and is planning an even more exciting NAIDOC event this July for Parramatta – down by the river. Ray Minniecon is a Kabi Kabi man with connections to the Gurang Gurang nation of South Queensland and the Ambrym Island of Vanuatu. Pastor Ray is a Director of Bunji Consultants strengthening Aboriginal leadership. He has a BA in Theology and supports Indigenous ex-service personnel and survivors of the Kinchela Boys Home.